Simplyeighties.com is a participant in the Amazon, ebay and etsy affiliate adverising programs. These allow us to earn fees by linking to items at their online stores. 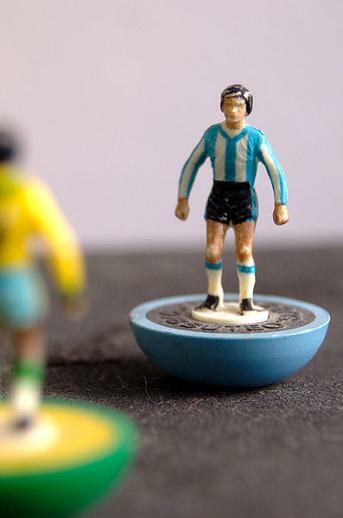 This well-produced and entertaining video (above) brought back a lot of memories for me, and features many of the accessories that were available to buy for Subbuteo back in the day, plus a look at how to play the game, too. This was a supposed to be a table-top soccer game, although I played it on the floor as we didn't have a spare table. The game featured players that looked like they had been set in concrete, and in which you controlled the ball by flicking the base of a player with your finger. Subbuteo was first made available in March 1947, although no pitch was supplied and the players were made from cardboard, believe it or not! 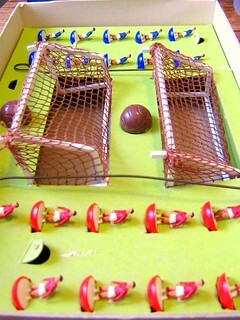 The first sets included goals with paper nets and wire frames and a ball made from cellulose acetate. Fortunately, by the time I was playing it in the 70s and 80s, the game (produced by Hasbro) had improved immensely, with all the basics such as a pitch, goals and corner flags all included. There were many luxurious accessories also available (at extra cost to your parents!) such as floodlights, stands and even the Queen! From the late 1980's the game also featured National team colours. Subbuteo was invented by Peter Adolph. 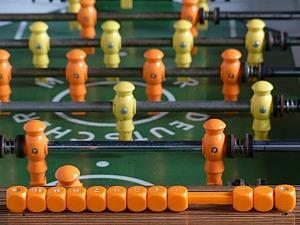 The game was based on Newfooty, a table football game invented in 1929 by William Lane Keeling of Liverpool. Adolph's version was much improved, eliminating the players heavy lead bases and making them a lot lighter. 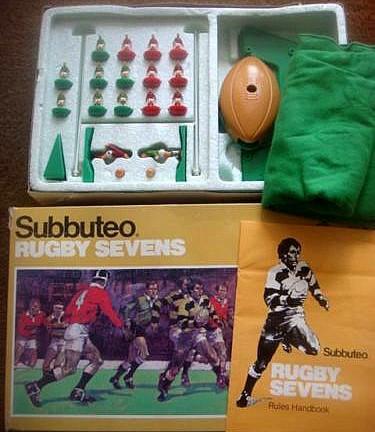 Although it is remembered by many as being a footie game, Subbuteo was also available as a cricket, rugby and a hockey game. If you're looking for original and collectable Subbuteo items from back in the day, then a great store to visit is Etsy. 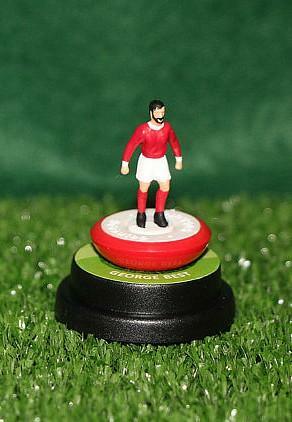 They have a particularly good range of hand-made, classic players such as Eric Cantona and Alan Shearer. Of course, ebay also has plenty to offer and you are sure to pick up some nostalgic gems on here. 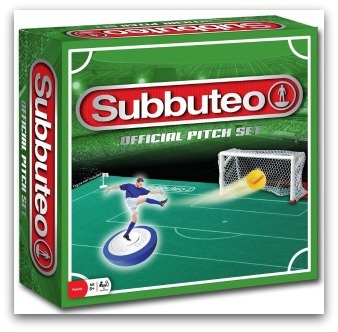 Indeed, there were almost endless pages of Subbuteo related items when I checked today. Even if you aren't looking to buy anything, it's a great nostalgia fest and you can easily find yourself wasting some considerable time browsing and discovering photos of items you had as a child. If you've always wondered why the game is called Subbuteo then I'll put you out of your misery. It's actually part of the new Latin name for a bird of prey Falco Subbuteo. The game's inventor, Peter Adolph, wanted to call the game "hobby", but couldn't obtain a trademark. This photo shows a basic Subbuteo starter set, which is pretty similiar to what I started out with as a child in the 1970s. It features classic red and blue players. Ideal for Everton vs Liverpool or Man Utd Vs Man City etc. 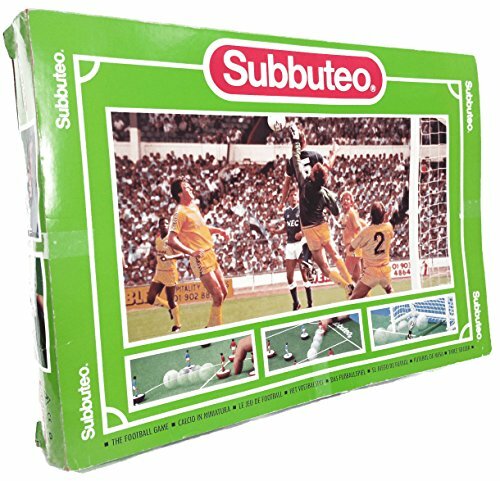 The alternative to Subbuteo was playing table football down at the local pub.